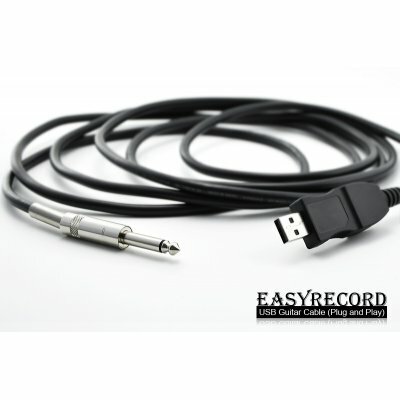 Successfully Added EasyRecord – USB Guitar Cable (Plug and Play) to your Shopping Cart. EasyRecord – USB Guitar Cable (Plug and Play), a brilliantly simple and effective device for easy music recording and editing. Rather than using an expensive conventional amplifier to record your music played on your guitar, this USB guitar cable gives you the advantage to easily interface with a music-editing software like Garage Band. It’s a must buy for any tech-savvy guitarist. With a ¼ inch jack on one end and a USB connector on the other, this USB guitar cable allows you to plug and play to instantly record the music you are playing. No software installation needed. Just plug the ¼ inch jack to your guitar and the USB to your computer. The cable is actually a sound card and will be recognized immediately by your computer as a sound input device. With software like Garage Band you can easily record and edit your music. Offered at a discounted wholesale price, this practical and cool gadget is now available in stock for immediate shipment. Order your sample today and it gets delivered within a week. Brought to you by your source for cool direct from factory electronics, Chinavasion. To use this product on a MAC computer simply plug the device in and open the Garage Band software found on your MAC computer. Other than Garage Band, there is plenty of free high quality software available. Just search the chat forums at http://www.kvraudio.com/forum/ for software recommendations from users just like you.